Posted August 25, 2016 & filed under Events in Dewey Beach DE. Whether you remember the days when “Jailhouse Rock” and “Burning Love” were playing on every radio or are looking for a unique way to enjoy your time in Dewey Beach, the Elvis Festival is the place to be at the end of September! A celebration that has visitors of all ages returning to our seaside town each year, it is always a huge hit and is one of our favorite festivals of the season. This year, the King of Rock and Roll returns on Friday, September 30 with a party that continues through the whole weekend. 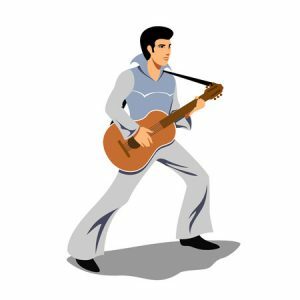 To pay tribute to Elvis Presley, the Rusty Rudder will be filled to the brim with Elvis impersonators and fans looking to have a great time. Located at 113 Dickinson Street, the restaurant offers a delicious array of coastal cuisine for lunch and dinner. Stop by on Friday night for dinner, drinks and entertainment – or spend the entire weekend singing along to all your favorite tunes. There will be more than 20 Elvis tribute artists vying to win the title of “best impersonator” on the restaurant’s two stages. Stick around for the entirety of the celebration to see who is dubbed the King! One of our favorite annual events here in Dewey Beach, the Elvis Festival takes place just a few minutes down the road from the Atlantic View Hotel. Book your stay with us today and get ready to rock the last weekend of September away. We can’t wait to see you here!